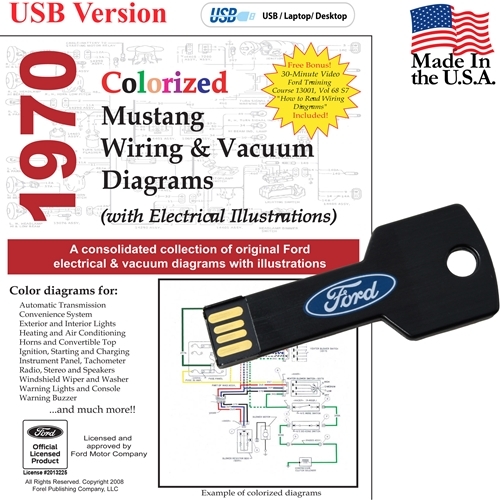 Description: The 1970 Colorized Mustang Wiring and Vacuum Diagrams manual contains a complete and comprehensive collection of wiring diagrams, schematics, and electrical illustrations. Each diagram and illustration is from an original Ford Motor Company publication and are the same manuals used by Ford technicians to troubleshoot electrical repairs. Unlike the B/W manuals on the market, the wiring diagrams in this manual have been carefully color coded to make it easier when tracing electrical lines. Windows, MAC, iOS, and Android - now also transportable to USB devices.